Long Beach, Calif. – August 28, 2011 – Formula DRIFT returned to the Las Vegas Motor Speedway for Round 6: After Dark. 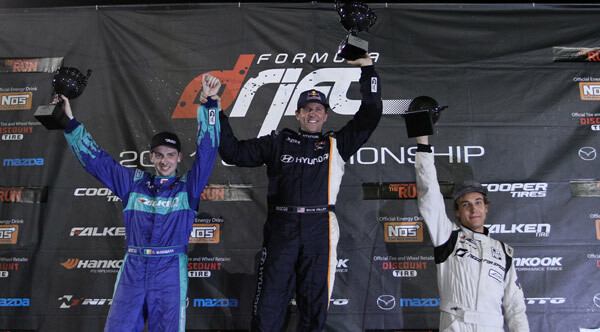 Rhys Millen in the Red Bull / Hankook Hyundai Genesis Coupe takes his first victory of the season. The chase for the championship tightens up heading in the final event of the season. The results of Round 6: After Dark at the Las Vegas Motor Speedway set-up what will be the most competitive finals in the history of the Series. Five drivers have a chance for the championship staying within in 52 points of one another. The competition was full of surprises as many of the point leaders were taken out of the Top 16 competition opening the door for other drivers to tighten the gap in the point standings. Underdog and current leader for “Rookie of the Year,” Aurimas “Odi” Bakchis in the Forged Racing Nissan 240SX surprised everyone moving into the Top 4 and to face Matt Powers in the Need for Speed / Nitto Nissan S14. After a hard fought battle Powers took third place and secured his chances to have a shot at the title. The Finals pitted Darren McNamara in the Falken Tire Saturn Sky against Rhys Millen in the Red Bull / Hankook Hyundai Genesis Coupe. With consistent driving throughout the weekend Millen proved why he is a former champion taking the victory and moving into 11th Place overall in the Championship Point Standings. It all comes down to the final event of the season. The Formula DRIFT Championship continues for Round 7: Title Fight at the Toyota Speedway at Irwindale on October 7-8. Tickets are currently on-sale online and are expected to sell out quickly.